Brick, Basket Weave and Fabric Covered and all three are easy to build. Ensemble beds like this one are perfectly comfortable but look rather plain Jane. Here are three terrific bedhead ideas to transform your bed. 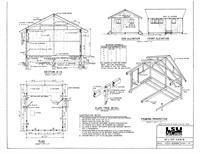 Design plans for a simple 16 X 20 cabin with bunk beds. Raised bed gardens are easy to maintain, look great and can be very efficient.